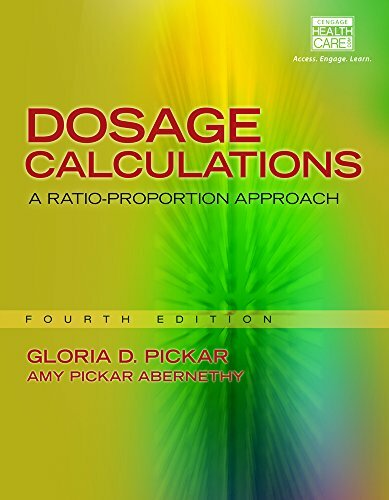 An excellent resource for anyone in or entering the field, market-leading DOSAGE CALCULATIONS: A RATIO-PROPORTION APPROACH, fourth edition, teaches you how to reduce errors and build your confidence in dosage calculation. It carefully examines both basic and advanced calculations, including intravenous medications and those specific to the pediatric patient. Extremely reader friendly, the book includes a comprehensive math review and a unique three-step method of calculating dosages that trains you to approach calculations logically. The new fourth edition reflects the latest drugs and protocol, regulations on medication abbreviations, medication administration technologies, and safe medication practices. Clinical simulations and Clinical Reasoning Skills scenarios based on QSEN principles help sharpen your clinical reasoning skills, while Section Examinations help prepare you for your future with test items formatted like graduate licensure examinations.